q&a: olive oil. burnt stuff. german knives. From time to time, the collective you, family and friends send in various cooking questions. What is the best way to season a steak? What can I do with brussel sprouts? Why did my cake explode? In an effort to share the knowledge, I will now compile these questions and quandaries here for your nerdy reading pleasure. You ask. I attempt to answer without sounding like a buffoon. Question: What German knife brands are worth looking at? 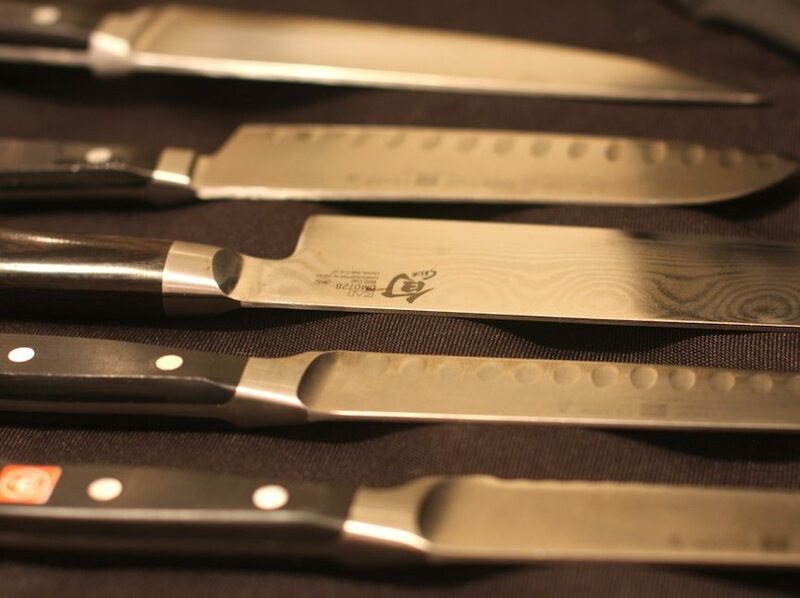 I have Wusthof, I’ve heard of Henkels (also bought a 7″ Miyabi Kaizen Santoku which is part of the Henckels clan), but are there any others worth checking out? Answer: I am partial to Wustof, which is what most of my collection is made up of. They are reasonably priced, long lasting (as long as they are maintained) and they fit well in my hand. I don’t like Henckels (also from Germany) primarily because it doesn’t have a natural grip for me. If your knife doesn’t feel like an extension of your hand, then you are more likely to cut yourself. Safety first, grasshoppers. On another note, more and more I see people moving over to Japanese knives. I recently got my first Shun, and I am in love with it. The Japanese make very beautiful, very sharp knives, since many of the knife makers were previously swordsmiths. (Yes, they are called swordsmiths. I looked it up!) For Japanese knives, you will want to use a steel with a finer grain than what you would use for German knives. Question: Is it okay if olive oil starts smoking a little? I’ve read that it completely ruins the entire dish, but I’ve also read recipes that call for a heat way too high for EVOO and even some say it should be smoking a little. Answer: First, extra virgin olive oil and olive oil vary greatly. Olive oil in general has a much lower smoke point than vegetable or nut oils. This means that they will smoke then burn then set fire at a much lower temperature. That being said, EVOO has a lower smoke point than regular olive oil. For frying or cooking on high heats, olive oil (which is part olive/part pomace) is your best bet. Reserve the EVOO for raw preparations or for brief/low heat cooking. When oil smokes it means that the pan and oil are very hot, so take it as a sign to start cooking. Letting the oil smoke too long without adding anything to the pan can lead to burnt oil, which will make your food taste burnt. It can also cause a fire and burn down your kitchen. Question: How do you get cooked-on browned oil off the inside of a pan? Answer: There are two ways. I prefer the baking soda method. Fill the pan with water, and sprinkle a good amount of baking soda over the burnt areas. Let it simmer for a while to loosen the stuff stuck to your pan. This will make it much easier to clean. Alternatively, you can mix baking soda and water into a paste. Then scrub the pan with the paste. This works well with enamel pots too. The other way, which works best when stuff is literally stuck to the pan, is kosher salt. Put kosher salt and a little bit of water to moisten it in a pan. 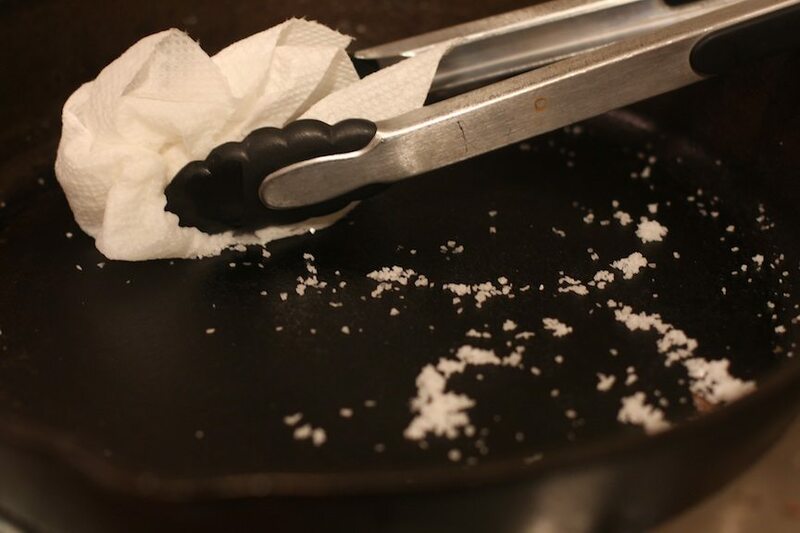 Use a paper towel or rag to scrub the pan using the salt. This is a great technique for cast iron. Have your own burning questions about cooking, food and the like?